On December 8, 2017 — the 50th anniversary of his death — NASA honored his often-ignored legacy and contributions to the agency. 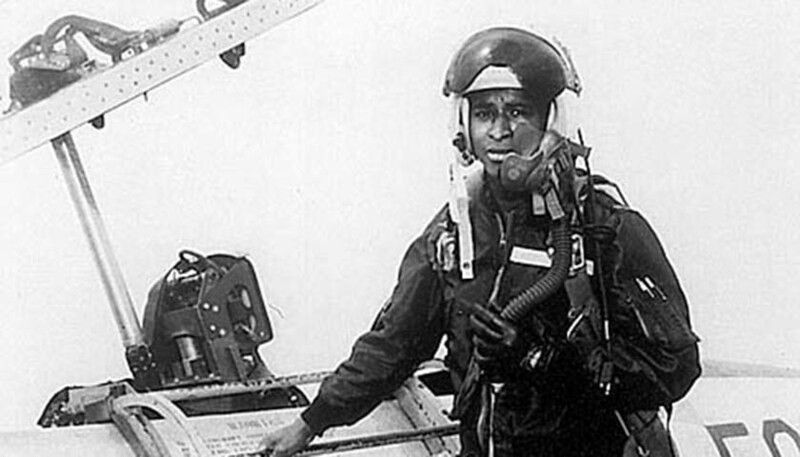 In planning a story for its annual Black History Month edition, Chicago Crusader staffers discovered that little was being done to honor Lawrence, while NASA held memorials to mark the 50th anniversary of three, White astronauts who perished in a fire aboard the Apollo 1 space module, during a preflight test. Lawrence died while training another pilot, Maj. John Royer, to perform the “flare” maneuver — an operation that Lawrence had already mastered — in the F-104 Starfighter. However, Rep. Bobby Rush (D-Va.) mounted a campaign that forced NASA to put Lawrence’s name on the Space Mirror Memorial in 1997 — thirty years after Lawrence’s death. The ceremony recognizing Lawrence in Dec. — although spirited, at times — was a somber one for the 300 guests that included decorated NASA astronauts, dignitaries, relatives, and friends, who had flown and driven miles across the country to honor Lawrence at the Kennedy Space Center in Cape Canaveral, Fla.
Members of Lawrence’s college fraternity, Omega Psi Phi, also attended to honor one of their own. On the sprawling grounds of the NASA facility, they participated in a two-and-a-half-hour ceremony that began at the Center for Space Education and culminated with an emotional wreath-laying ceremony at the base of the national Space Mirror Memorial, a massive black granite structure where Lawrence’s name is among those of 20 astronauts who either died in flight or in training. Dr. Herman B. White Jr., a physicist and lecturer at Bradley University in Peoria, Ill., Lawrence’s alma mater, gave a presentation where a memorial scholarship and a conference room bear Lawrence’s name. Recently, Ohio State University in Columbus, Ohio renamed a dormitory in Lawrence’s honor. Col. Robert Cabana, who flew on four shuttle missions, agreed. Dr. Barbara Lawrence shared her experiences with her brother as they grew up on the South Side of Chicago. She said, when Robert was young, he was a very disciplined student and dedicated to learning. Thanks to Chicago Crusader and NNPA for sharing this story with us.